John McCain died Auguste 25, 2018. He was a Republican Senator from Arizona. 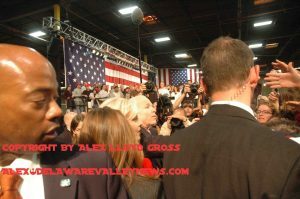 he also ran for president in 2008 and that election campaign brought him to the Delaware Valley on October 21, 2008. He appeared at a business on Marshal Lane in Bensalem, Bucks County Pa. For those that are too young to remember, he ran against Barack Obama and had Sarah Palin as his running mate. McCain was an elder statesman who could draw crowds but Obama was a rock star. 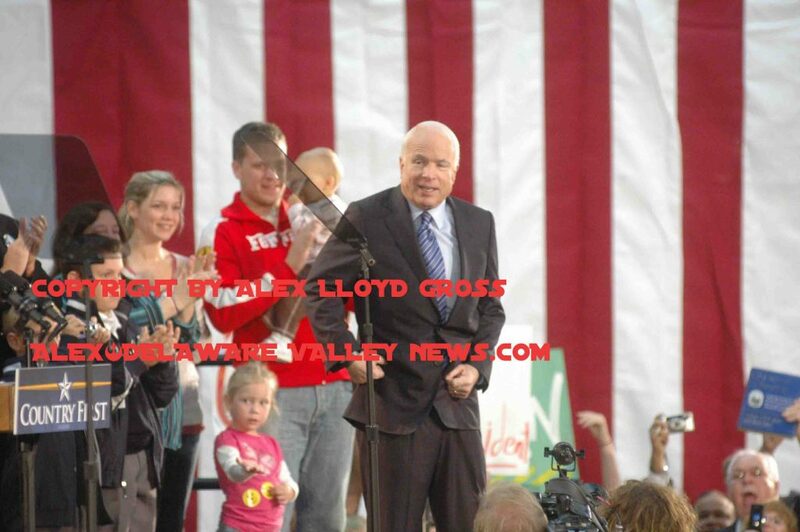 Alex Lloyd Gross Photo- Delaware Valley News.com John McCain onstage with his supporters in Bensalem October 21 2008. During the early morning hours, media set up camp on Marshal Lane and law enforcement did their customary sweeps. This was a campaign rally which mean lots of people on the republican ticket would show up to speak or at least be seen. This was a ticketed event, with tickets being distributed thought the local Republican Party offices. McCain showed up and spoke. The podium was bare, except for a small “Country First” placard on it. The crowd was small but very vocal. The media were treated like second class citizens by his campaign staff. When asked about rotation into different areas, we were told the campaign staff “could not be bothered by us” and they would be happy to talk after the event had concluded. Traveling press would have all the access. Local media would be stuck on risers in the rear. One could not wonder if that was the norm throughout the campaign and also wonder if that attitude played into the coverage and played a factor in his loss. Moments before the event, The Secret Service intervened and gave us what we needed to work. 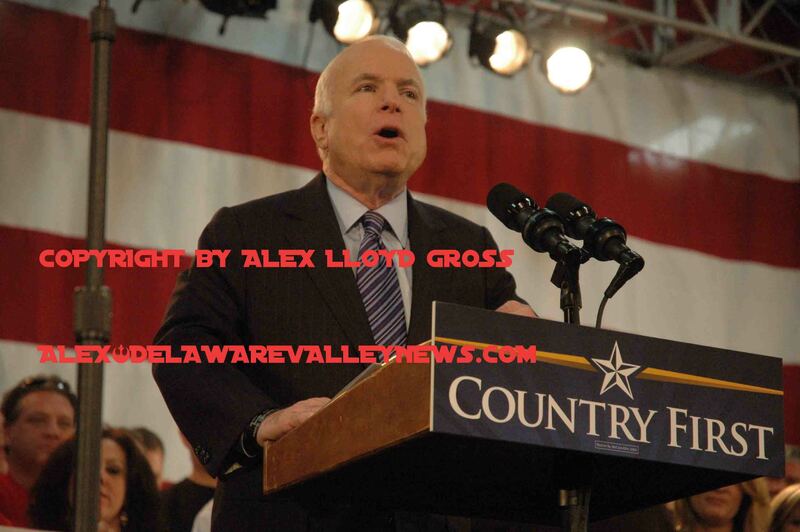 Alex Lloyd Gross Photo- John McCain is surrounded by supporters after his rally. As the event concluded, McCain tried to do a rope line. That is where a candidate walks to the front of the crowd and shakes hands. As he started to move to his left, there was a mad surge of his supporters. They were trying for autographs. a handshake, anything from the candidate. It got so bad, even the Secret Service was nervous. They set up barricades but those barricades had become undone and were moved forward by a few feet, by an over anxious crowd. McCain was a war hero who was shot down in Vietnam. He was captured, and tortured by Vietnamese Soldiers. The promised him freedom if he would denounce the United States. He refused and kept inquiring about his fellow servicemen who were also captured. He was freed years later. His service was disrespected by Donald Trump who was running for President. He said that McCain was “Not a war Hero. He was a War Hero because he was captured. I live people that weren’t captured,” McCain voted against Trump in many key votes, including Trump,s failed effort to dismantle the Affordable Care Act.